Germany's Jewish community blasts Alternative for Germany party after it launches a "Jewish" group within its ranks. 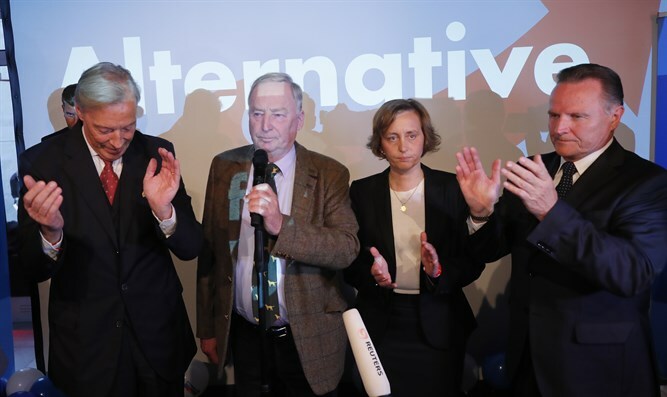 Germany's far-right party Alternative for Germany (AfD) on Sunday launched a "Jewish" group within its ranks which it says will battle against mass immigration of Muslim men with anti-Semitic views, sparking an outcry. The party said a group of 19 have formed "Jews in the AfD", and that anyone joining must be a card-carrying member of the party who is either ethnically or religiously Jewish, according to the AFP news agency. The move drew a backlash from Germany's Jewish community, which blasted the AfD as a "racist and anti-Semitic party". Some 250 people, many from Jewish organizations, also held a protest Sunday in Frankfurt against the new group. "You won't get a Kosher stamp from us," said Dalia Grinfeld, who heads the Jewish students Union in Germany, at the protest. The party has a history of controversial statements, particularly surrounding the Holocaust. Party member Bjoern Hoecke caused a firestorm in February of 2017 when he suggested that Germany should end its decades-long tradition of acknowledging and atoning for its Nazi past. Ahead of Sunday's launch, Jewish organizations including the Central Council of Jews in Germany issued a statement condemning the AfD. "The AfD is a party that provides a home for hatred for Jews as well as the relativizing, or even denial of the Holocaust," it said. Meanwhile, the AfD's deputy parliamentary group leader, Beatrix von Storch, hit back in an interview published Sunday by broadsheet Welt am Sonntag. Taking aim at the Central Council of Jews, von Storch compared it to "official churches", which she dismissed as "part of the establishment." The deputy parliamentary group leader of Chancellor Angela Merkel's CDU party, Stephan Harbarth, called the AfD's bid to start a Jewish wing "hypocrisy". "Whoever calls the Holocaust a speck of bird poo in German history does not fight anti-Semitism, but mocks its victims, and definitely does not stand on the side of the Jews," Harbarth was quoted as having told Sunday's edition of the Bild daily.